I am proud to report that this website won an Interactive Media Award (IMA) for Outstanding Achievement. This was a fun project from start to finish. Dave Pollock, an all around nice guy and talented craftsman, needed to kick start his young business. Dave knew he needed a unique brand and website to stand out from the many competitors in the San Diego construction business. 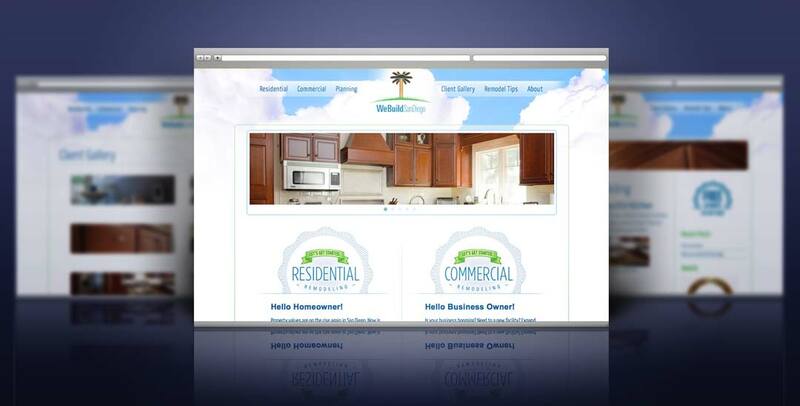 Website Development and custom WordPress theme for We Build San Diego. The logo, artfully craft by Vince, combines a t-square tool (to denote design and precision craftsmanship) with the shape of a palm tree, to create a highly recognizable brand mark that hit the nail on the head (cough). The unique logo, combines with the beautiful sky imagery, to extend the brand and create a refreshing, clean San Diego feel. Modern retro touches in the service emblems help to convey trust and reliability, old-school style. When outlining user goals and information architecture it is important for visitors be able to quickly find what specifically applies to them. Since the construction company caters to two unique audiences (Residential or Commercial), it is important that the home page layout be dominated by this major user choice. This user flow is also clear in the menu and site structure. The client needed to be able to add and edit content without the need for a developer or knowledge of code. Our go-to platform of choice is WordPress, for it’s ultra user-friendliness. We developed a custom theme to pixel perfection, and integrated the required functionality: photo gallery and contact form. We Build San Diego is steadily busy (and growing) remodeling homes throughout Southern California, thanks in part to their beautiful brand and effective website. If your business could use a brand boost, it’s easy to get started, just click here to contact me.